This isn't a reference to my own garden, though I haven't weeded yet, and I need to before my wife gets home. 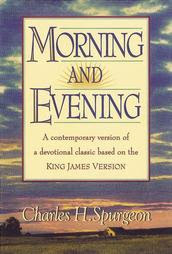 No, this is a reference to a devotional that I just read from Spurgeon's devotional book called Morning and Evening . My sister gave me this book for Christmas I think, quite a while ago. It is a really nice hardback book that looks great on my shelf, but I hadn't gotten around to reading it yet. Well, about a month ago, I picked it up because I was really struggling with being in the Word on a daily basis, so I thought I would try a devotional for a while. I have to say that it has been surprisingly good. I usually consider Spurgeon really stern and unyielding, but as I read these devotionals, I have found his material strongly flavored with mercy and grace. But not just any mercy and grace, I am talking about the kind of mercy and grace that can only come from one who realizes how much of a recipient of mercy and grace that they are. Come, therefore, O Lord, my God, my soul invites Thee earnestly, and waits for Thee eagerly. Come to me, O Jesus, my well-beloved, and plant fresh flowers in my garden, such as I see blooming in such perfection in Thy matchless character! Come, O my Father, who art the Husbandman, and deal with me in Thy tenderness and prudence! Come, O Holy Spirit, and bedew my whole nature, as the herbs are now moistened with the evening dews. O that God would speak to me. Speak, Lord, for Thy servant heareth! O that He would walk with me; I am ready to give up my whole heart and mind to Him, and every other thought is hushed. ... My Father, my elder Brother, my sweet Comforter, speak now in loving kindness, for Thou hast opened mine ear and I am not rebellious. Oh, how I need to echo these words every morning! I prayed them again as I typed them and proof read them. I like that phrase, "... deal with me ..." I flinched a little when I said that; I thought, man is that going to hurt, but then Spurgeon comes back with "... in Thy tenderness and prudence." I need God to deal with me. Truly I do, but I always hope that He does it in tenderness. I also love that last sentence, "My Father, my elder Brother, my sweet Comforter, speak now in loving kindness, for Thou has opened mine ear and I am not rebellious." This has been my prayer this morning. I hope it may have been an encouragement to at least one who has stumbled upon this blog today.